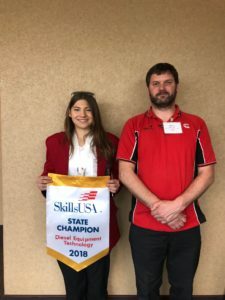 OnlineHS student McKenzie Budrow came away with honors this past weekend at the SkillsUSA State Championship, held in Yakima, WA. In the Diesel Technology division, she successfully competed in six different SkillsUSA Diesel Equipment skill areas. She earned a perfect score in Precision Measuring. In addition to technical knowledge and vocational skills, students are also graded on both the personal display and skills of leadership and professionalism. Not only did McKenzie place 1st, she is also the first female, high school student to represent Washington State to Nationals in the field of Diesel Power Technology, since the start of the competition in 1965!! As a top finalist, McKenzie was also awarded a $10,000 scholarship to Universal Technical Institute, a leading edge technical institute for auto and diesel training, with twelve high-tech campuses across the nation. McKenzie also serves as a student ambassador on our General Advisory Council, and is one of the first students to volunteer any time assistance is needed. For example, last week a representative (Lindsey Webb) from Congressman Rick Larsen’s office came to tour Sno-Isle, and McKenzie stepped right up to lead the tour. She has arranged her core classes to be able to take them online, so that she can participate in both Diesel and Fire Service here at Sno-Isle. 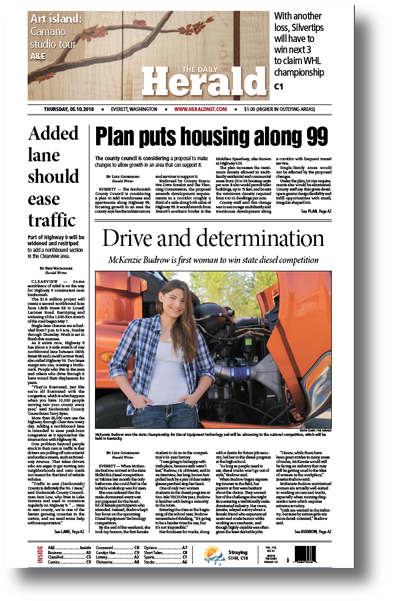 McKenzie is intelligent, driven, and motivated to make a bright future for herself! McKenzie has done an outstanding job here in class. She has amazing detail skills and applies everything she learns in a higher format. She is a natural guide for the others (those who listen..lol) and has an innate ability to learn the way of our industry. I have no doubt she will be very successful in this career path if she chooses to follow it. “She turns in solid work and is a joy to work with in person”, said Laura. The proud parents expressed their appreciation for the freedom and flexibility of e-learning & a request that the value to ALL students for vocation & technical education is promoted district-wide. 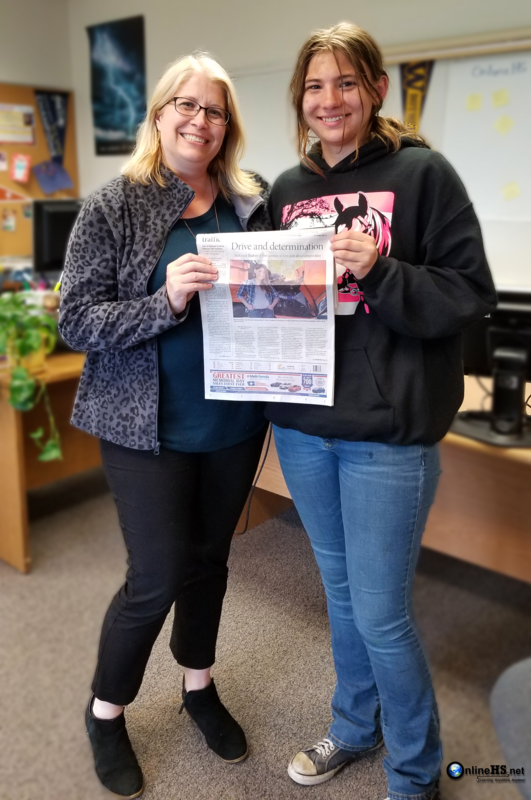 We wanted to thank you as the Principal of Everett Public SchoolsOnlineHS because it has helped McKenzie achieve this feat not only for herself, Sno-Isle Tech, Everett School District but Washington State! By supporting her as the “sending school” this past year we hope this can help reflect on the place OnlineHS has in the education spectrum in helping kids achieve success. What is more, we hope that you can impress upon the Everett School District and it’s other High School counselors that the Sno-Isle Technical Trade Skills Education is an extremely valuable asset that should be recognized and encouraged as a source of Education Choice with their students. It cannot be minimized or be considered a “back up” – it needs to be considered as an equal choice to higher education and other post-high school opportunities. There is, for a good portion of students out there, many who may struggle with your classic “learning styles” of “book-work and lecture”. The message needs to get to the high school level counselors that there are many more like McKenzie who excels best in hands-on learning. Her core education from the schools she attended was paramount and not to be minimized. For example, she credits her love of Algebra to her Everett High School teacher. and was able to put those skills to the test last week in her competition in a practical, hands-on application receiving a perfect score in Precision Measuring! As educators, finding the type of learning that will be meaningful to a student’s future is important. A voice for choice and advocating technical skills is what we hope McKenzie’s story will achieve. The SkillsUSA National Championship will be held June 25-29 in Louisville, Kentucky [info]. Our best wishes to McKenzie for a rewarding and satisfying experience at NATIONALS!